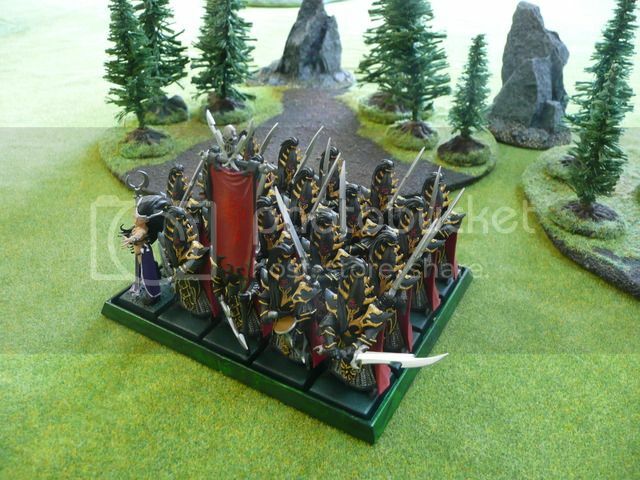 Here's my Dark Elf army. 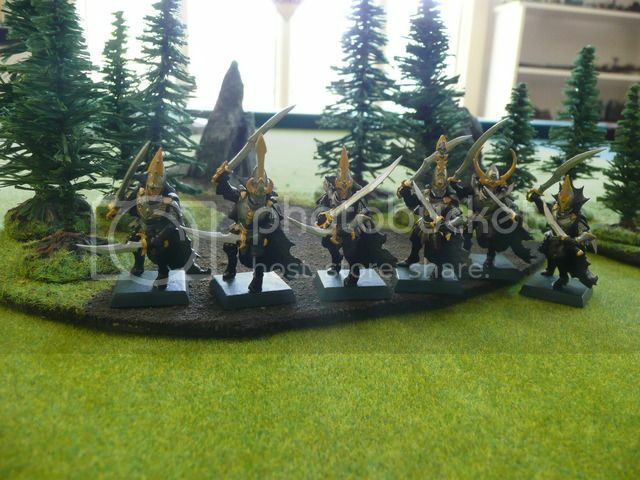 I like painting during sports games, especially NFL Sundays and the NBA playoffs, I started this army last year during the Pats first pre-season game and finished painting in the early rounds of the playoffs, so it always reminds me of the 4th super bowl. 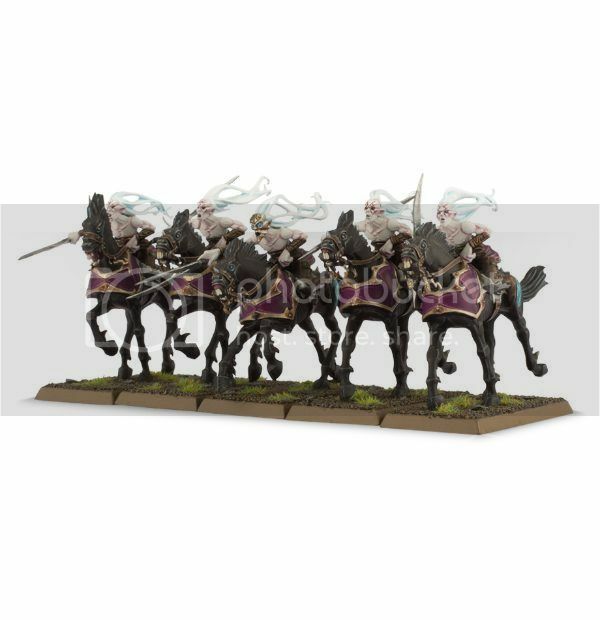 Usually when I make an army I base it around a special character, that way I have a good direction for conversions/painting. 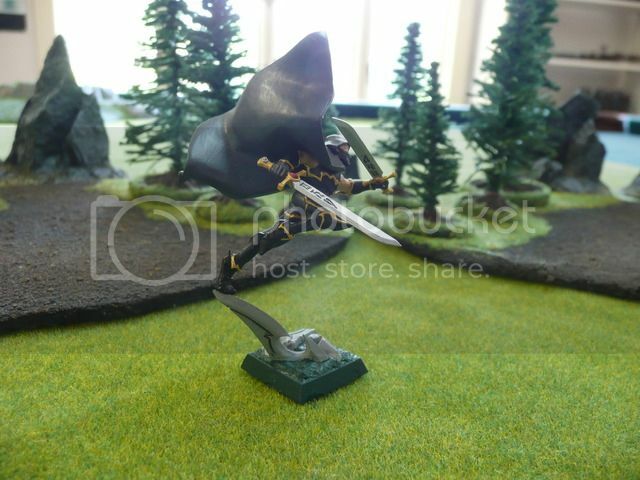 I ended up picking Hellebron since her model came for free with the Cauldron of Blood (and pretty much every other Dark Elf character was an old metal model). 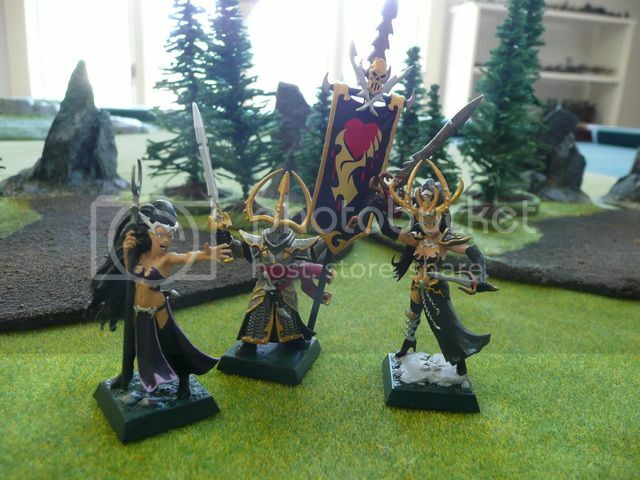 -Sorceress, BSB, Hellebron. 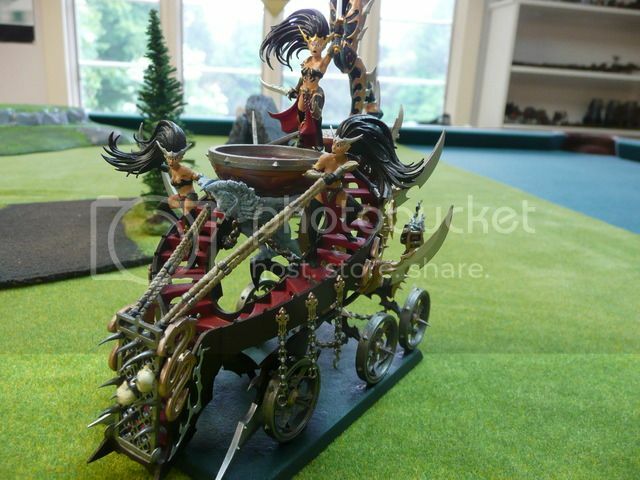 The BSB was converted from a chariot rider with bits from the Cold One Knights, Dreadlord, and more. 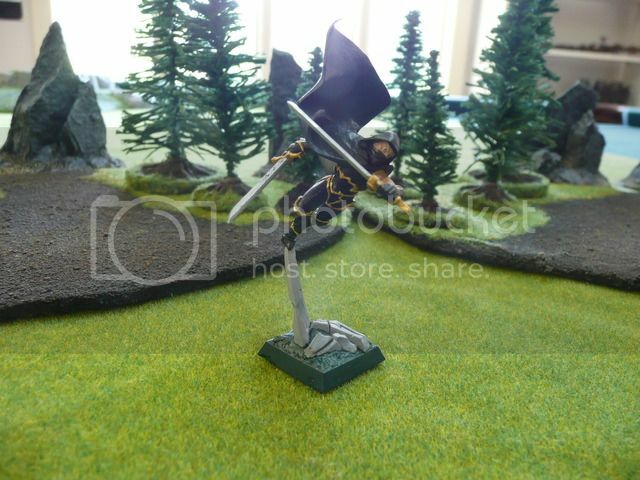 For Hellebron, her background said she only fights in her "youthful" form so I didn't get why GW's model had a mask, so I changed it and gave her a different sword that looked more fitting for something that's S10 and named "The Death Sword". 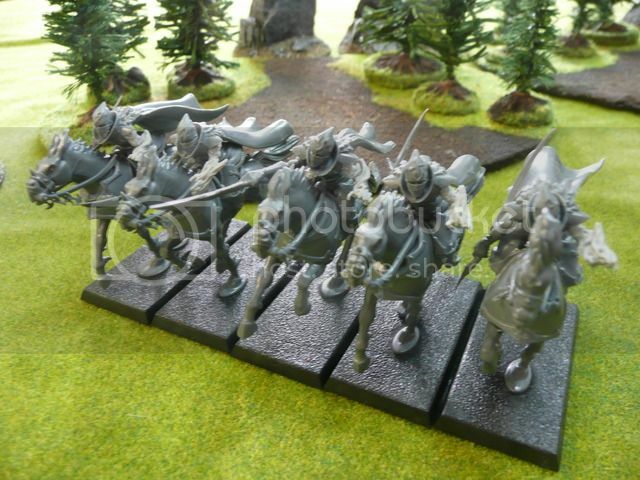 -Hellebron and the BSB were going to be in this unit so I converted them to look less "pirate" and more like knights on foot. 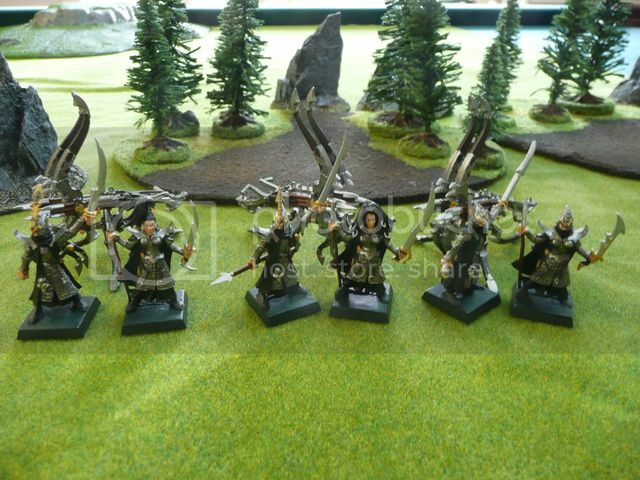 Several were converted into female troops with extra witch elf heads. 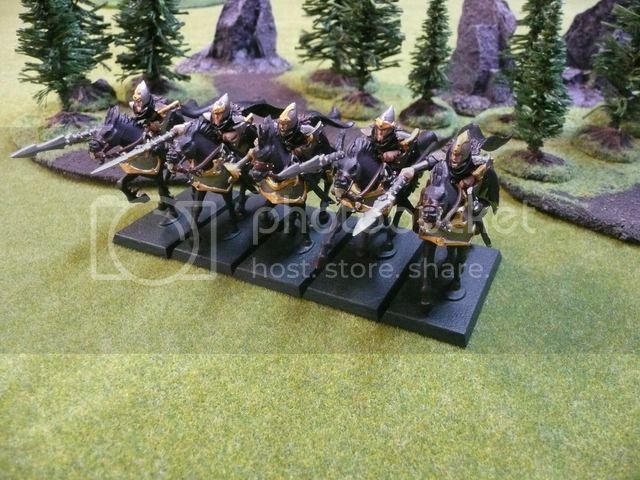 -I didn't really like GW's executioners, they looked a bit gimmicky with the skull helmets and also I didn't see how they could swing such oversized swords without killing their own guys so I used the Black Guard helmets and a bunch of green stuff to reposition the arms so they could hold more realistic sized great weapons. -All the poses are the same, so I tried to give them some variety with simple head/weapon conversions. 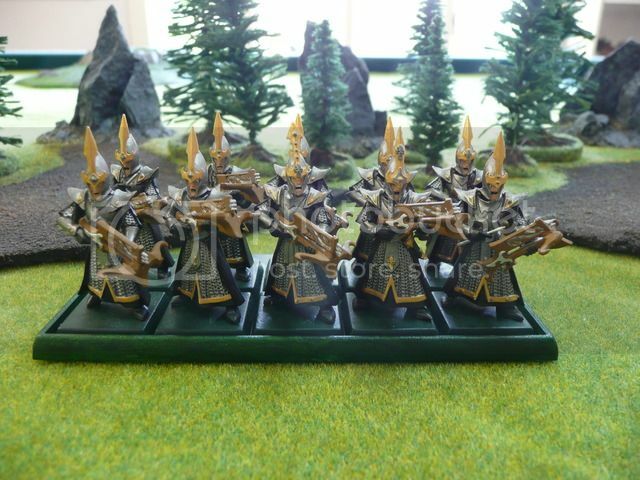 -Similar to the bolt throwers, the witch elves only have a few separate poses so I just tried to keep them unique with head/weapon/arm conversions. 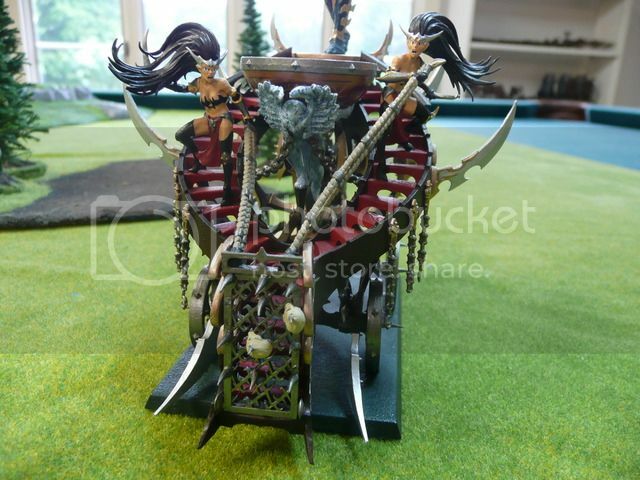 -Since the cauldron is a typical "centerpiece" model I tried to give it a bunch of conversions. 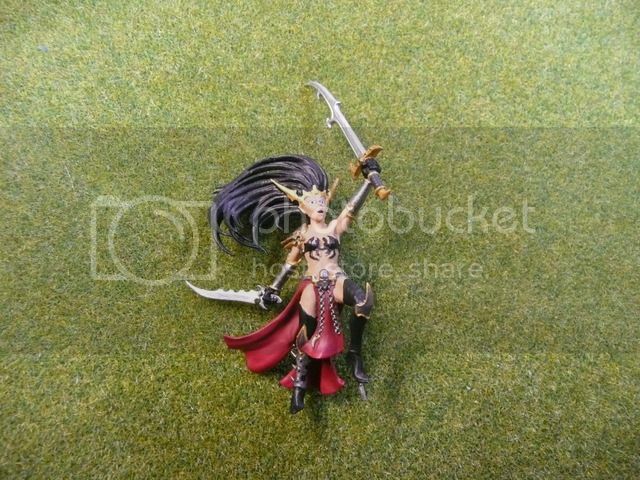 The Death Hag is removable with a pin since she could be singled out and killed in a duel so I didn't want her model permanently glued to the cauldron. I added chains and a High Elf helmet to the slave statue, it was supposed to represent the High Elf Phoenix King (the end times obviously changed all that, but at least it made sense at the time). 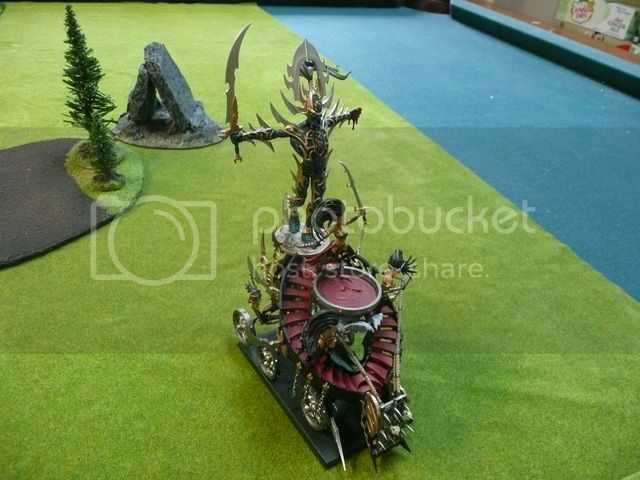 Since the cauldron also was a chariot and crashed into enemy units, I thought it would be cool if there was a boarding ramp/drawbridge thing that the riders could raise up while plowing into an enemy unit instead of just an open staircase. 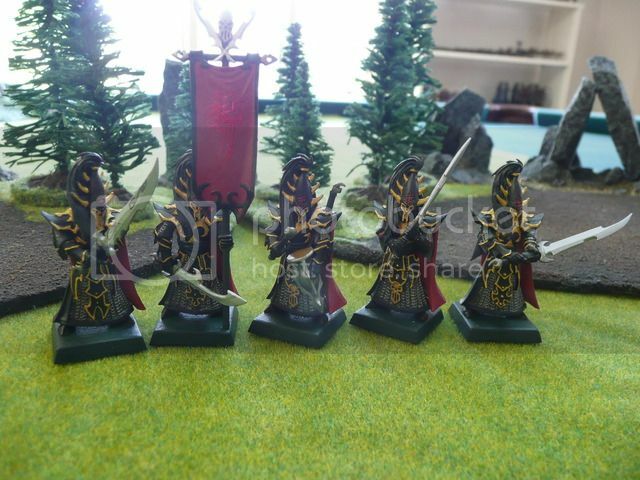 -Like the executioners, I loved the rules but not the GW models. 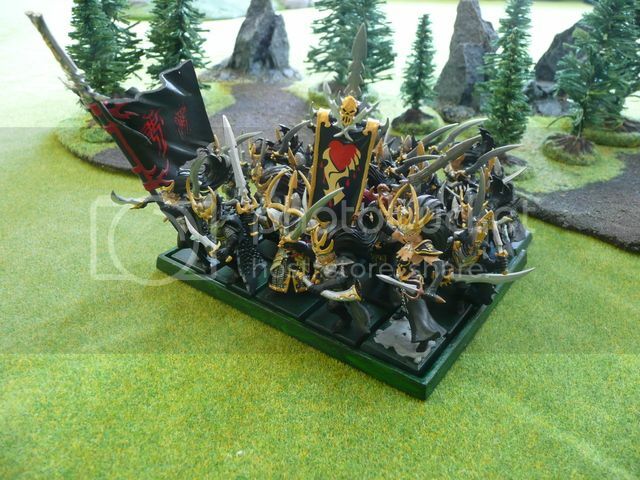 I thought they looked like something you'd see in an 80's heavy metal music video. 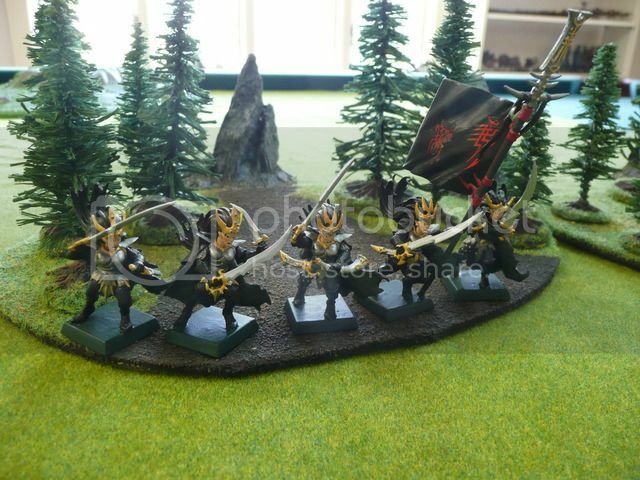 Instead I used parts from the dark rider set, and since they can fire the doombolt spell that's described as "black fire" I used the balefire arms from the 40k Dark Eldar Mandrakes. Nice work. 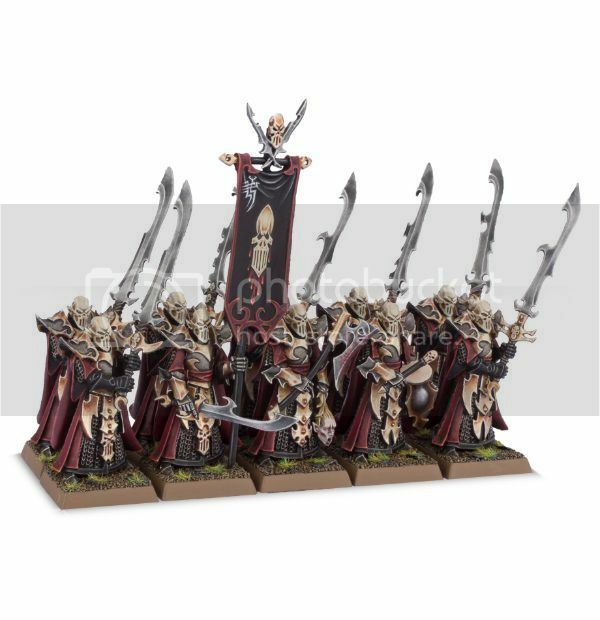 I like the great weapon conversions and the clean paint jobs. Nice, looking good. 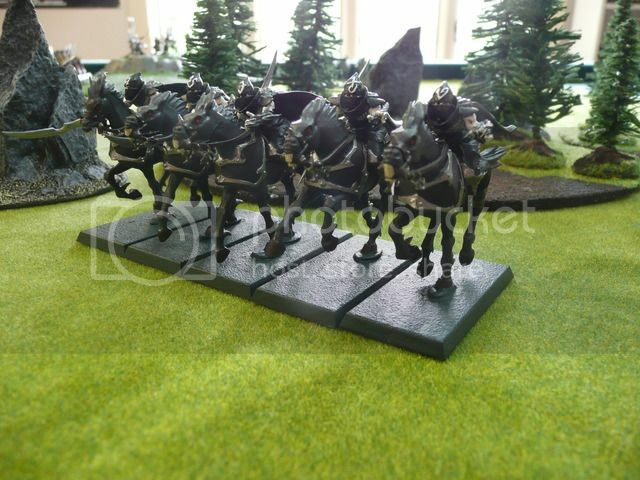 And glad to see some Warhammer Fantasy!